Since 1962 this company has been a family affair, earning its reputation as a trusted supplier to its many loyal customers. Self-locking gears prevent backdriving and inertial driving, and they may find applications in a wide variety of industries. 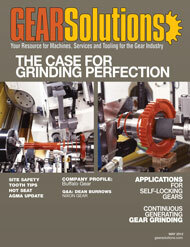 A report on new possibilities in the process design and analysis of continuous generating gear grinding. QUICKPOINT grinding machines from JUNKER allow end users to streamline production and increase productivity. Gear Motions, Inc., has announced a joint venture with KBE+ Inc., an engineering consulting firm that specializes in the design and development of gear trains and power transmission devices. The companies have reached an exclusive agreement to utilize each other’s specialties in their ongoing business operations.